Can I deal with the preliminaries first? As with all Athene CDs, the recording engineer Mike Bevill has again produced superlative sound which has an amazing clarity and stunning range. Ronan Magill was born in Sheffield in 1954 of Irish parents and was a founder member of the Yehudi Menuhin school. His periods of study fall into two phrases ... firstly, with Fanny Waterman and Benjamin Britten and then he vastly improved himself by studying with two excellent pianists, David Parkhouse and John Barstow and with the composer Philip Cannon. From there he studied with the late Yvonne Lefébure who in turn had been a pupil of Cortot. Magill is a gifted pianist. Gerrard Victory gave Magill his debut in Dublin in 1976 with the Paganini Rhapsody of Rachmaninov. He has played Tchaikovsky 1 and Brahms' 2 with Arthur Davison, the Schumann with Anthony Pay and the Rachmaninov 2 with Hilary Davan-Whetton. Magill has written a piano concerto, other piano pieces, three string quartets and a setting of John Donne's Hymn to God the Father. He is currently working on a cantata to words by John Dryden. But this epic piano work is receiving regular performances. This renewed interest in the Titanic is best known in James Cameron's long-winded film starring Leonardo Di Caprio and Kate Winslett which, apart from the last forty minutes, I found incredibly boring. The 1953 film with Clifton Webb, Barbara Stanwyck, Robert Wagner and Richard Basheart was vastly superior despite its age and lack of technology. Walter Lord's book A Night to Remember was made into a film in 1958. I do not wish to divert from Magill's achievement but this is unpretentious music. It is what it says an atmospheric poem and it is very long. But, it is a skilful evocation of various aspects of this awful tragedy. As a study in piano effects with accurate visual imagery it is very effective. There is a realism here from the sinister to the gaiety of the Titanic Waltz. The frolics of two young girls in third class is true to life as is the evocation of the cold starry night. The composer incorporates two pieces by Archibald Joyce (1873 - 1963) which were played on the Titanic, Remembrance and Song of Autumn. 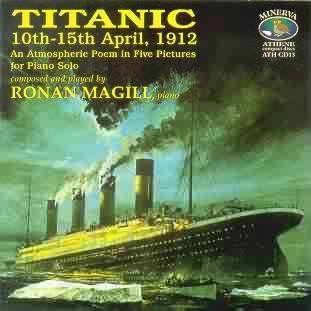 Track 10 is the Titanic Waltz, an original piece by Magill dedicated to Wallace Hartley and the band who carried on playing as the ship sank. All the eight members of the band were the subject of a memorial concert in the Albert Hall conducted by Elgar on 24 May 1912 in which he conducted one of his own works, the Enigma Variations as you might expect from such an arrogant man. Over 500 musicians from the London orchestras were present and Sir Henry Wood's orchestration of Chopin's Funeral March was also performed. It may have been forgotten that the London Symphony Orchestra were to sail on the Titanic but their trip was brought forward and they sailed on the Baltic in March. Magill's work was first performed in the Purcell Room during 1990. It was, to quote him, an experiment in sound. Recently he has made a suite of what he considers may be the best sections - the Lamentation of the Sea Dead, the Waltz and the Iceberg music. I am pleased to report that he is contemplating a suite of some of the shorter extracts.